Jones criteria, first devised in 1944 for the diagnosis of acute rheumatic fever (ARF) and its subsequent modifications [American College of Cardiology/American Heart Association (ACC/AHA,1992)], did not provide any caveat for the unusual and atypical articular presentations of this disease that may lead to errors or to delays in diagnosis. The fact that atypical form of the acute phase of the disease exists especially in the presence of atypical articular manifestations and passes unrecognized, is because of its heterogeneous presentation and lack of a specific pathognomonic diagnostic test. This diagnostic difficulty is accentuated in patients who present with arthritis as the only clinical manifestation of the disease. Atypical articular manifestations, such as in this case, poses a real challenge for the physician as overdiagnosis leads to undesirable stigma and exposure of patients to unnecessary prophylaxis while underdiagnosis leading to the development of rheumatic heart disease (RHD), which is preventable. A 13-year-old boy presented with complaints of joint pain and fever on and off for the last 3 years. Initially, ankle joints were involved followed 6 months later by both knee and vertebral spine (cervical and lumbosacral region). Joint pain was bilaterally symmetrical, nonmigratory, and increased on rest and at terminal movements. He could not sit, move his neck, and had difficulty turning in bed. It got partially relieved on medication but the patient was really never off the pain. There was no swelling and deformity of the joints. In addition, he had a history of recurrent episodes of upper respiratory tract infections with fever for the same duration. Fever was intermittent, rising to 103° F, usually lasting for a week. 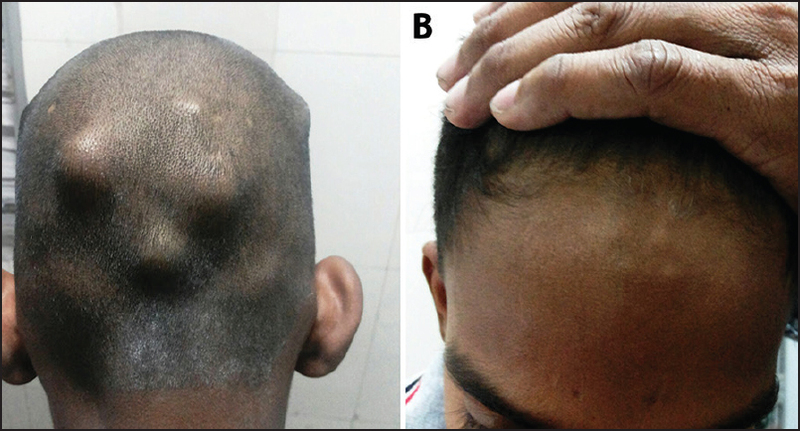 The patient visited several orthopedicians and the pediatric facility of a tertiary care hospital where he was investigated for connective tissue disorders and treated as growing pains with nonsteroidal anti-inflammatory drugs (NSAIDs). Recently, for the last 2 months, there was exacerbation of joint symptoms for which he was admitted to our hospital. There was involvement of the shoulder, elbow, metacarpophalangeal, proximal interphalangeal joints apart from the abovementioned joints. Additionally, there was generalized musculoskeletal pain with difficulty turning in bed and flexing the limbs. He noticed hard swellings over the forehead, the occiput, and the extensor surface of both forearms for the last 10 days. However, there was no recent history of sore throat, rash, breathlessness, orthopnea, paroxysmal nocturnal dyspnea, chest pain, hemoptysis, emotional lability and abnormal movements of the body, burning micturition, redness of eyes, travel to hilly areas, and bloody diarrhea. On admission, he appeared sick with a temperature of 101° F, respiratory rate, heart rate, and blood pressure was 24/min, 94/min, and 113/60 mmHg, respectively. Physical examination showed multiple swelling on the ulnar side of the forearm, frontal bone and occiput of the skull that were nontender, 0.5-2 cm, not attached to the underlying bone and skin [Figure 1]. There was tenderness in lower thoracic and lumbar spine, bilateral wrist, proximal interphalangeal joint, and metacarpophalangeal joint of hands, elbow, knee, and ankle. However, there was no swelling, redness or deformity at any joint. Cardiac examination revealed pansystolic murmur grade 2-3/6 on the apex radiating to the axilla and diastolic murmur grade 3/6 over the left parasternal area. Respiratory, neurological, and abdominal examinations were unremarkable. Complete blood count revealed Hemoglobin-12 g/dL, white cell count-10000/mm 3 (P-74/L-22/E-1), platelet 260000/mm 3, erythrocyte sedimentation rate (ESR) 57 mm/h, C-reactive protein (CRP) 22.3 mg/L, and elevated antistreptolysin O titer (364 IU/mL), anti-DNase B (679 U/mL). Chest X-ray and electrocardiogram were normal, as was the ophthalmic examination. Color-Doppler-Echocardiography revealed thickened mitral valve with moderate mitral regurgitation [Figure 2] and echogenic aortic valve with mild regurgitation. Throat swab and blood cultures were sterile while human leukocyte antigen (HLA)-B27, antinuclear antibodies (ANA), rheumatoid factor were negative. A diagnosis of ARF was made on the basis of revised Jones criteria (presence of carditis, polyarthritis, and evidence of recent streptococcal infection) and aspirin together with Benzathine penicillin prophylaxis instituted. However, there was a poor response to aspirin with complete pain relief being obtained by 6 weeks of therapy, while subcutaneous nodules initially increased in size for the first 2 weeks and then gradually decreased to disappear by almost 8 weeks of therapy. Histopathology confirmed subcutaneous nodules [Figure 2]. The patient is on penicillin prophylaxis for the past 6 months and is asymptomatic with no residual joint deformities. The classical migratory polyarthritis in ARF involves large joints (knee and ankle joints are the most common), with its onset around 2-3 weeks after a streptococcal infection of throat, the typical intense pain responds well to the use of NSAIDs and usually lasts has no more than 3 weeks in duration. Stollerman  noted that 32% of his patients with ARF did not present with a classical pattern of joint involvement. Goldsmith and Long  ascribed the presence of atypical arthritis (symmetric, longer duration, short latency period after streptococcal infection, and poor response to salicylates), to an immune response change to some kind of antigenic modification of Group A-beta-hemolytic streptococcus. The studies in the literature on this form of presentation of arthritis are relatively scarce. Pileggi and Ferriani  described joint involvement as atypical if at least one of the following characteristics were present: Longer duration than 3 weeks, involvement of small joints and/or cervical spine and/or hip joints, presence of monoarthritis, and unsatisfactory response to salicylates. Small joints involvement (metacarpophalangeal, interphalangeal) was reported in 2-8% by Terreri et al. while in Lin Chen and Robazzi et al. study it constituted 18% and 38.7% of their cases, respectively. Pileggi et al. described involvement of cervical spine and lumbar spine in 26% and 4%, respectively. The involvement of small joints of feet and hands and axial skeleton (spine and sacroiliac and hip joints) may cause diagnostic difficulties with poststreptococcal reactive arthritis (PSRA), juvenile rheumatoid arthritis, and ankylosing spondylitis, as in our case. Given the atypical presentation, cardiac work-up was never planned. With the declining incidence of ARF in the Western world, the diagnosis of PSRA is coined more frequently. PSRA patients are generally older, have a shorter interval between group A streptococcus (GAS) infection and onset of the symptom, respond poorly to NSAIDS, usually do not have carditis, and fail to fulfill the Jones criteria. Arthritis is additive, nonmigratory, and frequently chronic. Extra-articular manifestations (renal) may be present. Our patient had overlapping features with additive symmetric arthritis, involvement of spine and smaller joints with poor response to NSAIDS. However, the patient was young, had clinical carditis, and fulfilled the revised Jones criteria (WHO 2004). The case report emphasizes that poststreptococcal reactive arthritis is not a different entity but a part of the clinical spectrum of ARF with atypical arthritis. The index case had an unsatisfactory response to aspirin. Robazzi et al., Terreri et al. and Ferriani et al. reported poor response to NSAIDs in 4.9%, 15%, and 19.56% of their patients, respectively. The absence of significant cardiac symptoms can be attributed to the age old dictum, “severity of carditis is inversely proportional to severity of arthritis.” Moreover, Robazzi et al. and Banna et al. reported carditis with atypical arthritis in 57% and 63% patients, respectively. Our country is endemic for ARF, with most of the population residing in underserved areas with minimal to absent healthcare facilities. Most of the cases of atypical arthritis are thereby feared to be labeled as orthopedic problems and not necessarily as ARF. With increasing awareness and widespread availability of echocardiography, the prevalence of reported atypical arthritis is increasing. Strollerman (1975), Pileggi (2000), Banna (2013), and Robazzi (2014) reported atypical arthritis in 32%, 47%, 86.3%, and 70.9% patients, respectively. Atypical arthritis has been reported in studies from India. The latest revision of Jones criteria by AHA/ACC, 2015 has acknowledged these issues and has upgraded polyarthralgia and monoarthritis to major criteria and included monoarthralgia as minor criteria for high-risk populations. The Indian Council of Medical Research (ICMR) data suggest a progressive decline in RHD from 5.3 to 2.9 to below 1.0/1000 from 1970 to 2010. In addition, the hospital admission rate has declined by 5-26%. Due to this decrease in admission, the clinical teaching material, particularly the uncommon and rare variants, have almost disappeared, thus compromising the exposure and clinical skills of a trainee pediatrician. Rheumatologists and pediatricians should acknowledge and respect these rarer variants of rheumatic fever (atypical articular manifestations), thus circumventing unnecessary diagnostic and therapeutic delays with the inherent risk of irreversible cardiac sequelae. Guidelines for the diagnosis of rheumatic fever. Jones Criteria, 1992 update. Special writing group of the committee on Rheumatic fever, Endocarditis and Kawasaki disease of the Council on Cardiovascular Disease in the young of the American Heart Association. JAMA 1992;268:2069-73. Sokolow M, Snell AM. Atypical features of rheumatic fever in young adults. J Am Med Assoc 1947;133:981-9. Stollerman GH. Rheumatic Fever and Streptococcal Infection. New York: Grune and Stratton; 1975. p. 1-145. Goldsmith DP, Long SS. Poststreptococcal disease of childhood: A changing syndrome. Arthritis Rheum 1982;25:18. Pileggi GC, Ferriani VP. Atypical arthritis in children with rheumatic fever. J Pediatr (Rio J) 2000;76:49-54. Terreri MT, Caldas AM, Len CA, Ultchak F, Hilario MO. Clinical and demographic features of 193 patients with rheumatic fever. Rev Bras Reumatol 2006;46:385-90. Robazzi TC, de Araújo SR, Costa Sde A, de Oliveira Júnior AB, Nunes LS, Guimarães I. Articular manifestations in patients with atypical rheumatic fever. Rev Bras Reumatol 2014;54:268-72. EL Banna HH, Swelam RA. Clinical presentations of atypical arthritis in Egyptian children with acute rheumatic fever. J Am Sci 2013;9:253-61. Gewitz MH, Baltimore RS, Tani LY, Sable CA, Shulman ST, Carapetis J, et al; American Heart Association Committee on Rheumatic Fever, Endocarditis, and Kawasaki Disease of the Council on Cardiovascular Disease in the Young. Revision of the Jones criteria for the diagnosis of acute rheumatic fever in the era of Doppler echocardiography: A scientific statement from the American Heart Association. Circulation 2015;131:1806-18. Ramakrishnan S, Kothari SS, Juneja R, Bhargava B, Saxena A, Bahl VK. Prevalence of rheumatic heart disease: Has it declined in India? Natl Med J India 2009;22:72-4.